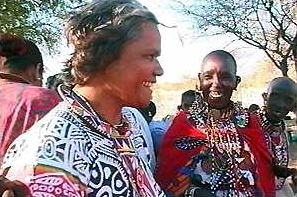 The film follows the journey of a group of Australian Aborigines who travel to East Africa to share stories over land rights with Masai people. BBC News story here. The twentieth century as revealed through postcards and their messages – from the collection of the artist Tom Phillips. The first Video Nation Short broadcast on BBC 2 in March 1994. Programmes, items and interviews covered subjects including: Pop Art, Cinema Verite, Chuck Jones and Michael Mann. Programmes and subjects included: Bart Simpson as black American icon, Benetton’s United Colours campaign and Dances with Wolves through the eyes of American Indian Media. – On documentaries and feature films – on locations in Europe, Africa, Asia, North America. – Worked across independent film and mainstream TV, with directors including Peter Wollen, Michael Eaton, Lutz Becker.